Spring is in the air, and with that comes the time to increase your fitness and enhance your yoga practice. And this week's giveaway will help you do just that, 'cause we're giving away three annual subscriptions to the entire DOYOUYOGA library! We get it, things come up: Deadlines at work, a new season of Game of Thrones... who has time for yoga? You do, with guided programs that fit perfectly in your busy schedule through DOYOUYOGA Premium. You can track your progress, get rewarded, and stay motivated along the way. Whether you have just a few minutes or an hour, you'll find the perfect class for your needs. Set your mood and level, pick a class with your favorite teacher, and just start practicing. It's that simple. Get your yoga on wherever, whenever with a DOYOUYOGA Premium subscription. You can start shredding with Sadie Nardini, detoxing with Jessica Rose, or up your fitness with Daniel Scott (or even better, all three!). So get on your mat and check in with your favorite yoga teachers whenever you want. What could be better than that? The giveaway runs from Monday, March 14, 2016 to Monday, March 21, 2016. 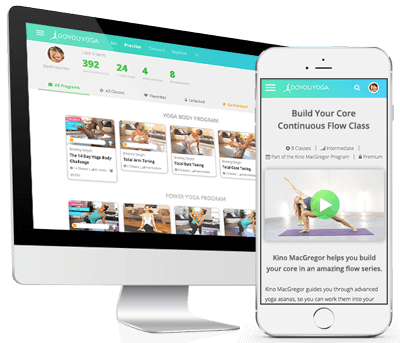 On Monday, March 21st, three randomly selected users will be chosen to win a one year subscription to DOYOUYOGA. So make sure to share and comment to enter! Congratulations to @kosmicyogi, @hekate50s, and @robinyoga for winning this week's giveaway! Thank you to all who participated!